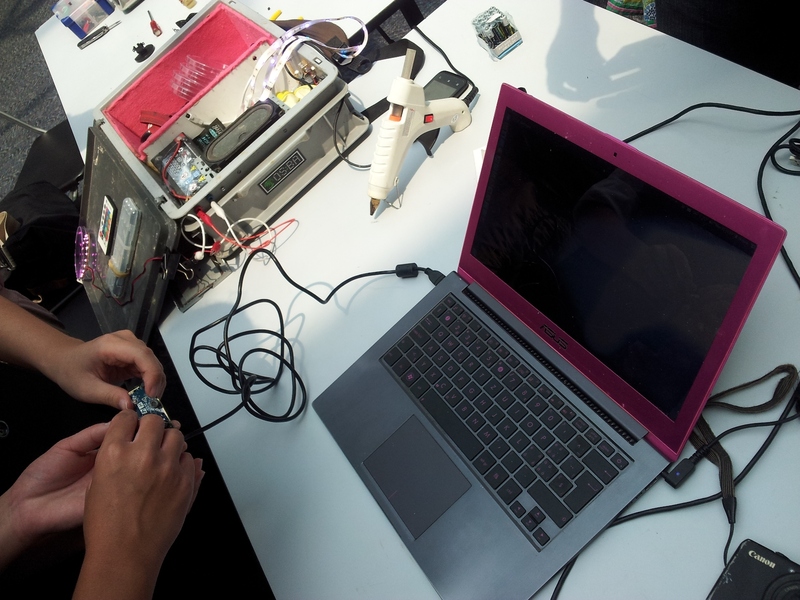 A few days after the yarnbombing event, we held a Mini Maker Faire Workshop for Secondary School Students conducted by Kiruthika, our lead organiser for the Singapore Mini Maker Faire. The workshop took place on 28 May afternoon at Science Centre Singapore. Students from various schools came together and learnt how to make paper circuits and how to turn a laser pointer into a microscope. Sounds fun? Here are some photos taken during the workshop! Crocheting has always been close to my heart, something which I learnt from my Godmother and from my Primary School’s Art Club. I always find it therapeutic. However, I do not have much friends who share the same hobby and I also crochet less as I started picking up other hobbies later on in life. Hence, imagine my excitement when I got to know makers [through the Singapore Mini Maker Faire (SMMF)] who also crochet and knit. For example, we have Ling Ling (SMMF12 & SMMF13 Maker), Huey Ling (SMMF13 Maker) and Agatha (SMMF13 Maker) who crochet different kind of things using different kind of materials. 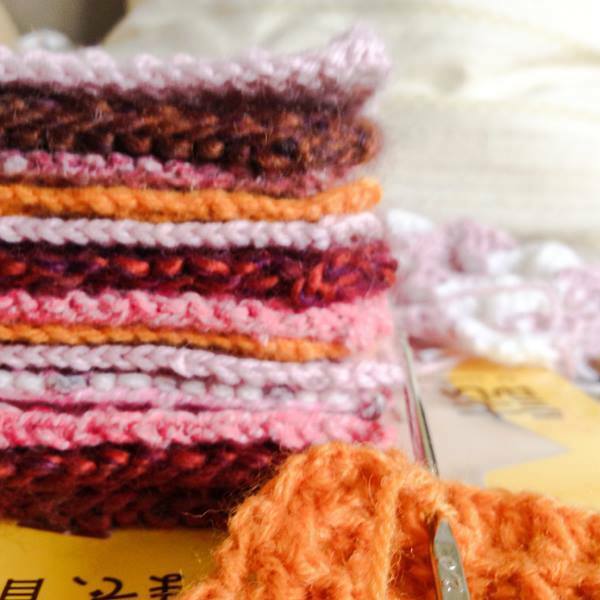 Last year, Ling Ling even took it a step further and ran an “Intro to Crochet for Beginners” workshop during our Singapore Mini Maker Faire! 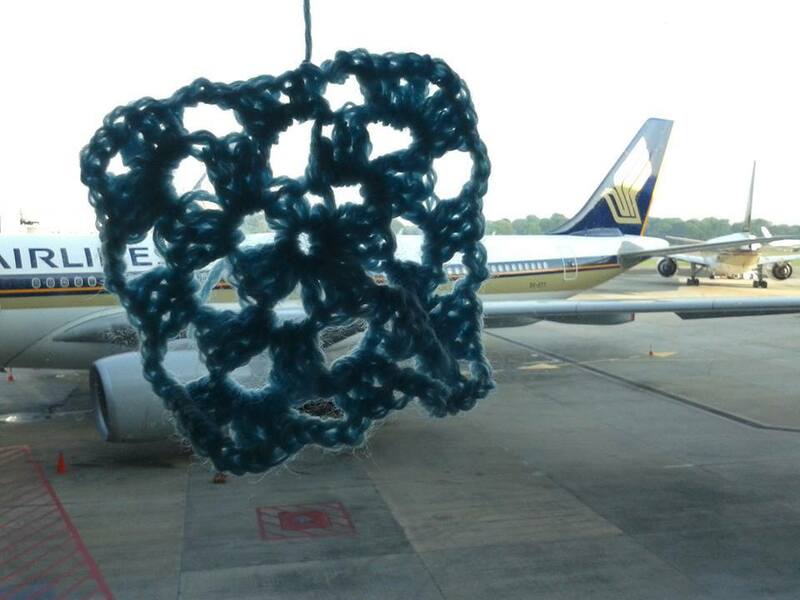 I first heard of yarnbombing last year, around the time when we held our second Singapore Mini Maker Faire. The vibrant colourful yarnbombed trees and giant structures online caught my attention. The shared yarnbombing projects also captured a bit of attention on our Singapore Mini Maker Faire Facebook Page. But it was earlier this year when yarnbombing was brought up again. Agatha was inspired by a yarnbombing project in Hong Kong and re-ignited the discussion again. A few of us were enthused enough to start moving into action and before you know it, the first yarnbombing project under the Singapore Mini Maker Faire was initiated. The yarnbombing project would not have been possible without the strong ground-up initiative and support. Agatha shared how she has got to know Mona and a few other ladies from the sewing community, and how there was a good response to the suggestion of yarnbombing. Mona, currently an active quilter, works closely with Agatha to spearhead this yarnbombing initiative. She shared that she had volunteered to arrange for a craft meetup for the followers of “The Sewing Network”, a Facebook group for those who are interested in sewing and needle crafts. During the discussion about the exact crafts that could be brought to the meetup, the yarnbombing idea popped up and grew. With Agatha and Mona helming this project, a date for the first yarnbombing session was fixed very quickly for 1 May, Labour Day public holiday at Science Centre Singapore. The initiative moved in an organic fashion. When we first met, there were only 14 of us, including two young children of Kiruthika, the lead organiser of this year’s Singapore Mini Maker Faire. Most of us did not know each other, and we spent some time introducing ourselves while we crochet or knit. It was a cosy and fun session. The group decided that we will use one of the railings at the turnstile area to be our pilot yarnbombing spot. We crowded around the choice location and quickly set to work, choosing the pieces to combine around the railing. Before we know it, the job is done, and we had an impromptu yarnbombed railing at the front of the Science Centre! Then the group asked “What’s next?”. One suggestion was to yarnbomb the animatronic dinosaur in front of the Centre. We went to take a look, and once again very quickly made plans for a giant scarf. Everyone were excited to meet again for the next session and we set the next date on the spot, 24 May. The next few weeks saw furious knitting and crocheting by the many enthusiasts and there were a lot of sharing of progress online. 24 May morning was a busy morning. Twenty volunteers turned out to assemble the granny squares into a scarf which ended up to be 6.2metre by 0.4 metre long! We were all truly amazed by the efforts both by those who contributed their granny squares and those who turned up to help with the assembly. It was heartening to also see some volunteers who came to learn and contribute too, one male volunteer included! We were also glad that the yarnbombing project received media attention and subsequently reported in Straits Times Life! and Zao Bao after the event. Besides giving attention to the yarnbombing project, it was great that they also highlighted the Singapore Mini Maker Faire. Hopefully with the media attention, we can garner more interest both in the Phase 2 of the yarnbombing project (we are moving on to the Singapore Mini Maker Faire venue!) and the Faire itself! Interested in yarnbombing or to learn knitting or crocheting? We welcome you to join us at the Senja-Cashew Community Club on 22 June, 10am – 12pm where the next phase will be embarked. 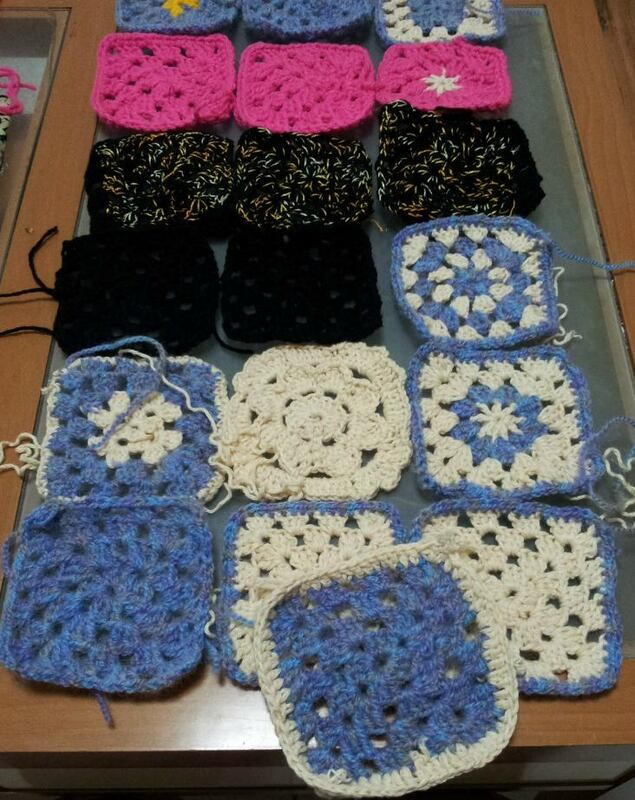 If you are able to join us or wish to contribute 4 x 4 inch granny squares, do contact Agatha and Mona through the Yarnbombing Singapore Facebook Page or email to yarnbombingsg@yahoo.com.sg. Hands-on activities for the month of June! Like the idea of family bonding over hands-on fun with clay, electronics, paper circuits or other activities to “wow” your children? Leading up to the Singapore Mini Maker Faire on 26 & 27 July at Senja-Cashew CC, Science Centre Singapore has organised a series of hands-on activities since the beginning of the year. Bring your child to join us on 7 June (Saturday), 10am – 1pm, and immerse into a morning of creativity. It started with just a handful of students who readily took up the hands-on challenge to build their own microscope by hacking a webcam. In a short while, the two tables that were full of gadgets gradually drew attention, until a point that we can hardly view what was happening at Marc Dusseiller’s pop-up biotinkering space. 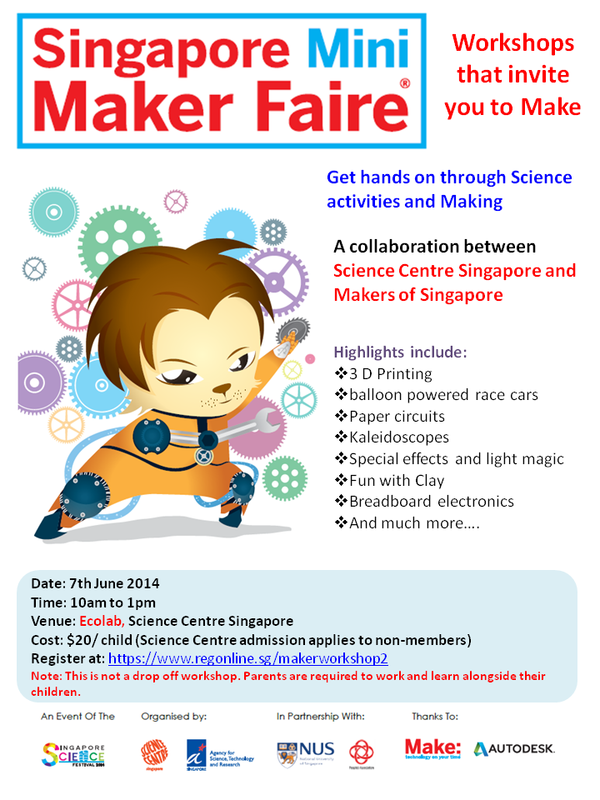 Wondered what else were done at the pop-up makerspace held at Science Centre Singapore on 13 Mar 2014? Within the short 2 hours, the impromptu participants tried their hands at taking things apart, and putting them together again, and experimented with different items that they could view using their DIY microscope, including a live spider and a cotton stainer! Lots of spontaneous efforts were also put in into ensure the live insects are viewable on the DIY microscope, amusing the crowd watching the demonstration. Marc also brought along plenty of interesting gadgets which captured our attention. Check out the two suitcases he brought his stuffs in! One of them is a “Lab in a suitcase” while the other contains stuffs that he made. Inspiring, isn’t it? Seems like some people will start packing their own maker suitcase/bag soon! Marc’s lab in a suitcase! Maker tools in a suitcase! If you are looking forward to some tinkering and making, check out the next pop-up event on 22 March at Tampines Central Community Club. This 22nd March, join Maker Elda Webb Embark in a journey to discover your inner maker. Take joy in the creative capacity of your mind. Making is not a passive activity, fill your imagination with inspiration, generate ideas and understand your world without fears and discover how to keep doing this over and over again until you feel it is right. Born and raised in Monterrey, Mexico, she is a curious person by nature. Design Thinking has being her problem solving secret. Pupil of the Montessori system, she pretty much used its principles all the way into University. Her curiosity to solve problems in a holistic manner guided her to study Architecture, where she found a great tool to help her overcome her lack of drawing skills. She discovered the world of Computer 3D modeling and started sharing her knowledge as an assistant teacher for the Visualization department at her alma mater the Tecnológico de Monterrey (ITESM). She worked at several companies as a graphic designer and 3D modeller creating renders and other visual media for their marketing departments. She now works for Autodesk as a Senior Learning Content Developer here in Singapore, creating visual content to showcase the new features of AutoCAD and its verticals. She believes that we should be proactive and design solutions to our everyday problems and make them a reality by acting upon them. But she understands that in order for anybody to think like a designer and start making things we need to let go of our fears and put the designer’s hat to start thinking like one and to remind us that we can all start by making something and be a designer in our own way. Always tinkering about problems and a long list of solutions, you can find her folding paper and watching a movie to relax or checking out TED.com, design books and all sorts of other platforms for inspiration. She is always on the look for things that could help her solve or understand problems better. Her tagline How flexible is your imagination? pretty much summarizes the way she approaches any challenge and how we all should approach the problems that come along our way while being a Maker. If you are coming to Science Centre Singapore on 13th March 2014, do drop by at the Annexe Foyer. Marc Dusseiller – transdisciplinary scholar, cultural facilitator and artist – will be setting up a mobile Makerspace from 11am onwards at the Annexe foyer. So, drop in for some spontaneous bio tinkering and be surprised. Marc performs DIY workshops in lo-fi electronics, hardware hacking, microscopy, music and robotics. He has coorganized the DIY festival Zurich, workshops for artists, schools and children as the former president of the Swiss Mechatronic Art Society. Currently, he is developing means to perform bio and nanotechnoloty research and dissemination (Hackteria) in a DIY fashion in kitchens, ateliers and in developing countries.